Wincanton - Gennnes/Le Rossier Twinning Association urgently needs people to take part in this year's visit to our French twin town. The link between the two towns has been in place for over 30 years and it would be a great shame to have to break the link due to lack of numbers visiting. At present there are 16 members wishing to travel but with costs it is not a viable trip unless more interested parties can be found. This year's trip takes place from Sunday 12th August until 19th August 2012, at a cost of £175 per person (£100 for under 16's and under 5's travel free). 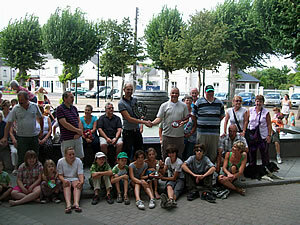 Guests are hosted by families from the twin town of which nearly 50 visited Wincanton last summer. During the week there are organised visits to a chateau, a vineyard with a BBQ and a themed party night - this year's theme is "The Olympics". If you are interested in the visit please contact Mr Alan Jones, Parlour House, Redlynch, Bruton BA10 0NH.